Situated along the Seine near Jardin des Plantes is this boat space. 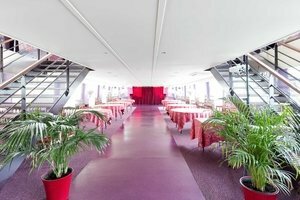 With exceptional access to Paris this space is perfect for an Evening Event, Food Event or Product Launch. 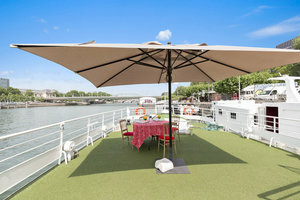 Renting this space gives you access to the whole 3-story boat including two wonderfully decorated gathering rooms as well as a terrace where you can take in all the beauty Paris has to offer. 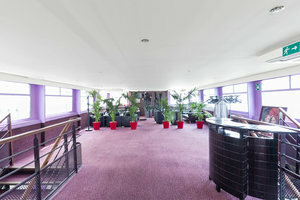 The interiors here include large windows spanning each wall, purple carpets and turf floors on the terrace. With facilities including internet, a kitchen as well as sound and video equipment this space can accommodate a variety of events. Located on the Seine, this space is a unique opportunity to see Paris in a unique setting. It is a great venue to engage with customers, clients or coworkers in a one-of-a-kind environment.